What are the popular places to visit in Colorado? Explore the map of Colorado, the eighth largest state in the United States. This state spans across an area of 104,094 square miles. As of 2017, there were 5.607 million people living in Colorado, making it the 21st most populated state of the country. Denver is the capital, as well as, the largest city of Colorado. The state shares its borders with Wyoming, Nebraska, Kansas, Oklahoma, New Mexico, Utah, and Arizona. Mount Elbert, which has a height of approximately 4,401 meters, is the highest point in the state. Colorado was admitted to the Union on August 1, 1876, as the 38th state. Before its admissions into the Union, the state was known as Colorado Territory. 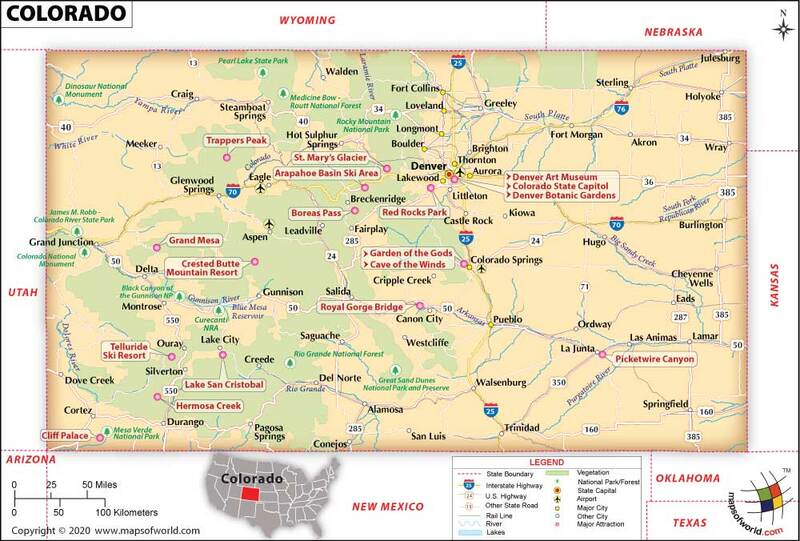 About Colorado Map: - The map of Colorado depicts the state boundary, major cities, other cities, and the state capital. Interstate highway, rail lines, airports, lakes, rivers, national parks, major attractions, etc, are also clearly demarcated on the map. The official flag of Colorado consists of three horizontal stripes, top and bottom being navy blue and middle stripe being white. On top of these stripes a circular red "C" is placed, filled with a golden disk. Colorado reminds us of blue spruce, alpine scenery, steam train and of course, Colorado Springs. This Centennial State is full of wonders awaiting a passionate look. Encompassing total area of 269,595 square kilometers, Colorado is divided into 64 counties. It is the 8th largest state by area in the US. The area was first inhabited by various Native American tribes more than 13,000 years ago. The eastern part of the Rocky Mountains was in earlier times a major route of migration for the spread of civilization throughout the American land. Apache and Comanche tribes inhabited Eastern and Southeastern parts of the state. The region was acquired by the Union in the Louisiana purchase of 1803 from the French. The land achieved US statehood on August 1, 1876, making it the 38th US state. Almost rectangle-shaped, Colorado is landlocked and bordered by Wyoming, Kansas, Nebraska, Oklahoma, New Mexico, Utah and Arizona. The state covers the southern Rocky Mountains, the western most part of the great plains as well as parts of the Colorado plateau. Colorado was named after the Colorado River which passes through the state. Northwestern Colorado is sparsely populated due to desert plateaus and alpine mountains. There are 53 summits of the Rocky mountain ranges in Colorado that are 14,000 feet or higher in elevation. Mount Elbert, at 14,440 feet is the tallest peak in the Rockies and the second-highest peak in the contiguous US. Colorado is a land of the dark forests of pine where the tropic stars shine. From outdoor adventure in national parks to bustling nightlife in cosmopolitan cities and welcoming towns, Colorado is the stuff vacations are made of. The state is famous for its part in the US history and heritage, unparalleled beauty, adventure winter sports, Rocky Mountain cuisine and pot tourism. Mesa Verde National Park, Garden of the Gods, Pike National Forest, Million Dollar Highway, Gunnison National Park and Colorado National Monument are some of the most popular tourist attractions in Colorado. The state is worth a visit in any season for adventure sports such as skiing, backpacking, ballooning and white water rafting. By Air - Twice the size of Manhattan, Denver International Airport (DIA) is one of the busiest airports in the US. It handles most of the air traffic between Chicago and the Pacific coast. By Train - Amtrak operates California Zephyr and Southwest Chief through the state. By Road - Interstate 25 (I-25) and I-70 are the two major corridors serving the state north-south and east-west respectively. The Colorado Department of Education oversees public education and literacy programs. The Colorado College, Colorado Mesa University, Colorado State University, Metropolitan State University of Denver and Redstone college are some of the most prestigious institutions in the state. Read more here. Colorado was founded in 1876, hundred years after the Declaration of Independence, thereby earning the moniker, 'Centennial State'. Nicknamed 'Mile High City', Denver is the state capital and the largest city. It is the first state in the US to legalize use of marijuana for recreational purposes.